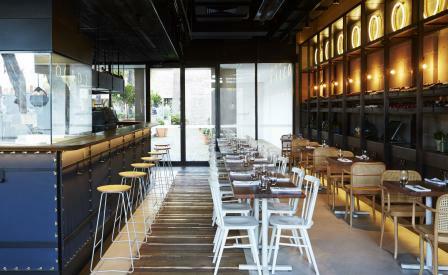 Distinct for its equal emphasis on affordability, atmosphere and cuisine, Sydney’s Beccafico Bar & Trattoria would love visitors to believe that the design of the space was an afterthought. And while the raw, modern decor of the Surry Hills restaurant is successful in remaining an unobtrusive yet stylish backdrop, the interiors — pulled together by local studio Matt Wood Design — tell their own unique story, marrying the three distinct concepts of Italian, beachside and Scandinavian. A stripped-back aesthetic is the consistent theme through all three approaches in a space where timbers sit alongside dark woods and bare bricks, and low tables and rattan-back seating take on an unexpectedly sultry ambience, thanks to circular tube lighting, uniformly lined up along the walls. The laid-back beach vibe emerges via decorative plants, a timber boardwalk leading diners into the space and joinery components made from recycled and fire charred hardwoods, which reflect the textures and colours of the country’s famous shores. The result is a space that seamlessly joins all three concepts together to work as one cohesive entity for a relaxed vibe that often spills out into the restaurant’s courtyard. The same approach is applied to the menu, devised by Head Chef Diego Arata, which puts an unmistakably Aussie twist on a series of southern Italian dishes. Brunch options are given a reboot with Italian ingredients — see the smashed avocado with house-smoked provolone and gremolata on toast — and vice versa at dinner, with offerings such as roasted spatchcock with rosemary, chilli, garlic, heirloom carrots and spring onion.